Last step to reach the Inca city. You may have heard from many people who have traveled to Machu Picchu, that the road is surprising, or that it causes fear; is a zigzag road where the only authorized vehicles travel in Aguas Calientes (Machu Picchu village); is called Hiram Bingham, in honor of the person who in 1911 reveals Machu Picchu to the world. As you travel this road towards the Inca city, you will see how the image of the town of Aguas Calientes below you dissipates. You will also see the people who decided to climb to Machu Picchu on foot; which are usually the people who did not book the Machu Picchu tickets that include the mountains. Where to buy bus tickets to Machu Picchu? In Av. Hermanos Ayar S/N, before the Ruinas bridge. The ticket office is open from 05:00 am to 09:00 pm. Av. Infancia 433 – Wanchaq: from 08:00 am to 12:45 pm and from 03:00 pm to 06:00 pm. Av. El Sol 380 – Interbank bank: from 08:00 am to 12:45 pm and from 03:00 pm to 06:00 pm. During the high season in Machu Picchu (June, July, August) there are often large queues at the Aguas Calientes ticket booth, so if you come during this time, it may be better to buy tickets in Cusco, this will save valuable time in Aguas Calientes and Machu Picchu. The bus tickets from Aguas Calientes to Machu Picchu are valid for 3 days, so you will have enough time to buy them while you are in Cusco. Where to board the buses from Aguas Calientes to Machu Picchu? Half a block from the train station of Aguas Calientes, just before the ruins bridge that leads to Machu Picchu and in front of the bus ticket office to Machu Picchu, is the place where you have to board your bus. 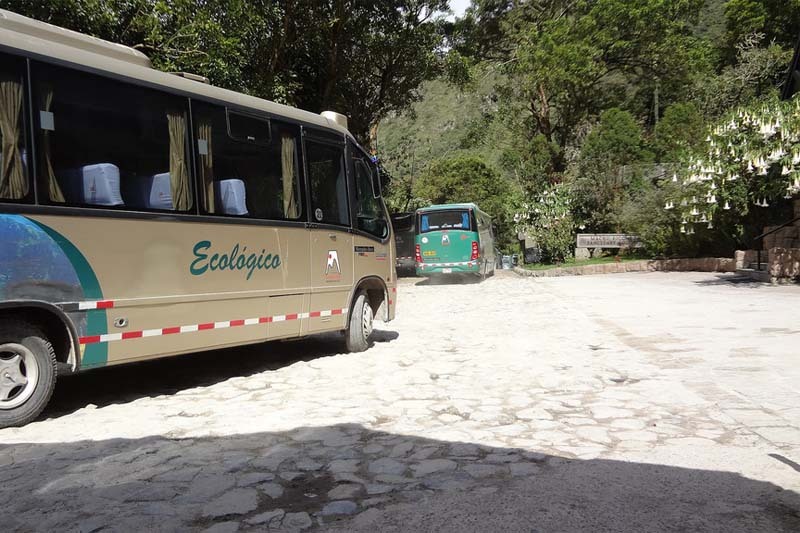 It is a small stop where ecological buses pick people up to take them to Machu Picchu. 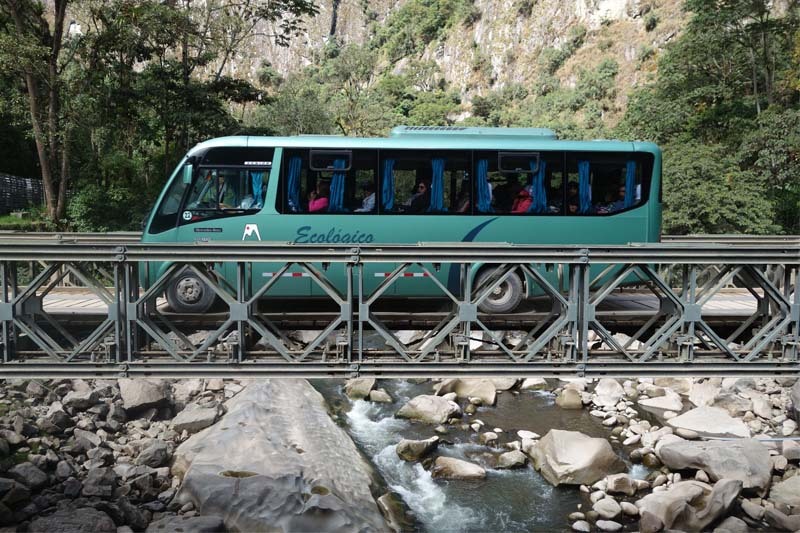 In which cases is it advisable to board the buses to Machu Picchu? The walk from Aguas Calientes to Machu Picchu is very beautiful, but it can be tiring. So we recommend doing the trek, unless it is in the following situations. Coming with children, especially if they are small, or with people of advanced age demand to buy the bus tickets to Machu Picchu. The trek from Aguas Calientes to Machu Picchu can be very tiring, and you must remember that the best of Machu Picchu is up there in the mountains, and that they need energy to go through them. It is about avoiding the same thing as in the previous case. If you think you would get very tired after traveling the hour and a half of the trek from Aguas Calientes to Machu Picchu, then you better board one of the buses to Machu Picchu, you will not like to be tired before you can enjoy the amazing structures of Machu Picchu. the Inca city. The Machu Picchu tickets that include the mountains, besides allowing you to enter the Inca city, will allow you to travel, some of the mountains of Machu Picchu. Machu Picchu or Huayna Picchu, you choose. Mountain tours can be very tiring, but they offer some of the best views of the Inca city of Machu Picchu. This is quite logical, you will need all your energy to ascend the mountains of Machu Picchu, so if you have reserved Machu Picchu tickets that include the mountains, hop on the bus. In case you want to walk up and down by bus, you will find a ticket office at the entrance to the national park of Machu Picchu.